It is a simple fact that you don’t need very many bucks for a dairy herd. Because a buck can sire dozens of kids, you should keep only the best for breeding. That means that a lot of bucklings will become pets, brush eaters, or meat. Unless they will be butchered in a few months, bucklings should be castrated because intact bucks get stinky and pee on themselves. They also tend to fight with each other during the breeding season. There are three methods of castration, and breeders can easily learn the methods themselves. Banding is probably the most popular method of castration because it is simple and inexpensive. A rubber band the size of a penny is placed around the base of the scrotum using a special tool that opens up the band wide enough to get it over the testicles and in place. Some argue this is the most inhumane method of castration because it cuts off blood flow to the entire scrotal area, which causes everything below the band to atrophy and fall off. We used this method for a few years, and most bucklings didn’t seem terribly bothered by it. A few bucklings would scream for a few minutes up to an hour, and some would get very depressed for a few hours or a day following banding. Because of the anaerobic environment that exists under the band, there is a risk of tetanus with this type of castration. Emasculation is the safest method of castration because the skin is never broken, but it is not immediately obvious that you have done the job. With this method the cord that goes to each testicle is crushed using a special instrument called a burdizzo. Although a kid usually lets out a short bleat when the cord is clamped, most recover fully within fifteen minutes. Some cattle ranchers say they have an unacceptably high rate of failure with this type of castration, which makes sense when you see that a cattle burdizzo is quite large and requires the use of two hands to operate. The goat and sheep burdizzo is much smaller and can be closed with one hand by most people. We started using this method several years ago and have not had any failure. When I had my first goats, I read that surgical castration was the most humane method, so I took my first kids to the vet for the surgical castration procedure. As we stood in the parking lot, I held the bucklings as the vet sliced open each side of the scrotum, pulled out each testicle and dropped it on the ground. He told me he was leaving the scrotum open so that it could drain because stitching it up would be more likely to result in an infection. Although the boys survived the ordeal and were just fine, I decided to look into other methods of castration. Some people do prefer surgical castration, though, and if you want to do it yourself, you should have a vet or an experienced breeder teach you. This is Part 4 in our series on issues related to kidding season, which appears every Monday this month. 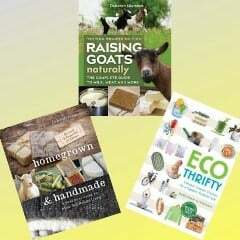 It is an excerpt from Raising Goats Naturally: The Complete Guide to Milk, Meat, and More by Deborah Niemann. 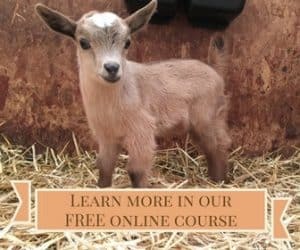 If the baby goats are going to be sold at about four months from birth, is there a need to castrate them? If a buck is not going to be used for breeding, he should be castrated. Intact bucks do not make good pets because they stink and pee on themselves.